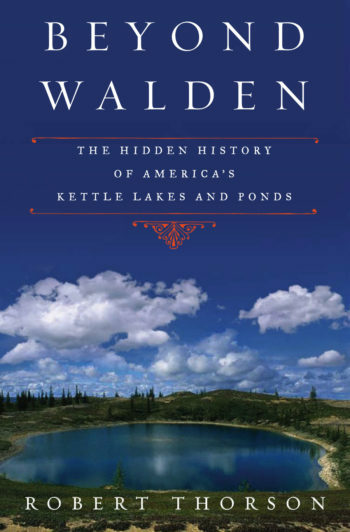 America’s most well-known kettle is Walden Pond, in Concord, Massachusetts. Though Walden is hardly spectacular and lies well off the beaten track, it was the centerpiece of what would become an American Lake District, the counterpart to the English Lake District that so inspired the romantic poets. Since then, it has become the symbolic center for the 20th century environmental consciousness in America. Largely, this is because its most famous resident, the iconoclastic philosopher, Henry David Thoreau, can be properly considered as America’s first lake scientist, or limnologist. Thoreau might have predicted that the popularity of kettles could be their demise. And now that the modern economy of kettle lake country is no longer chiefly about fur trading, timbering, or dairying, but rather about family recreation and tourism, lake culture is loving lakes to death. Some are turning from crystal clear to murky greenish brown as lakes warm, and as an invisible flood of organic nutrients seep in from the shore. Effective lake management in a changing world requires that the body politic of kettle lake country appreciate how distinctive their signature landscape really is and how the system of sandy soils, marshy savannahs, blue lakes, and lazy rivers works together as a well lubricated hydraulic machine. Robert Thorson, author of Stone by Stone and Exploring Stone Walls brings his own particular blend of heartland science, history and memoir to the story of kettle lakes. Beyond Walden is a call to safeguard this speckled band of sky blue water for future generations. Read more about the book at Beyond Walden. A rich, exhaustive account of one of America’s threatened ecological jewels.